If you’ve been following along, you realize by now that it’s not easy to infer the cause of a phenomenon, even in a well-controlled experiment. What about observational experiments, which are what many ecologists and evolutionary biologists have? Take one paper of mine that I’m reasonably happy with (PLoS One e52035; 2012. doi: 10.1371/journal.pone.0052035). One part of that paper included an experiment of sorts. We1 established experimental gardens at the Kirstenbosch National Botanical Garden and at a mid-elevation site on Jonaskop mountain about 100km due east of Kirstenbosch. Among other things we were interested both in how certain traits in newly formed leaves (specific leaf area, stomatal pore index, and leaf area) differed depending on the age of the plant and on the garden in which they were grown. This part of the paper is analogous to the thought experiment on corn that we’ve discussed so far. Since the plants were grown from wild-collected seedlings, we obviously couldn’t duplicate genotypes across gardens. We also didn’t have enough seed from individual maternal plants to replicate families across the gardens. So we did the best we could. We randomized seedlings within populations and split populations across gardens. You’ll see the results from this part of the analysis in the figure below. Similarly, the figure above makes it clear that which garden the plants are grown in influences these (and other) traits. These results won’t surprise anyone whose worked with plants. The traits plants have depend both on how old the plant is and on where its grown. So far a reasonably straightforward experiment, but how about this? 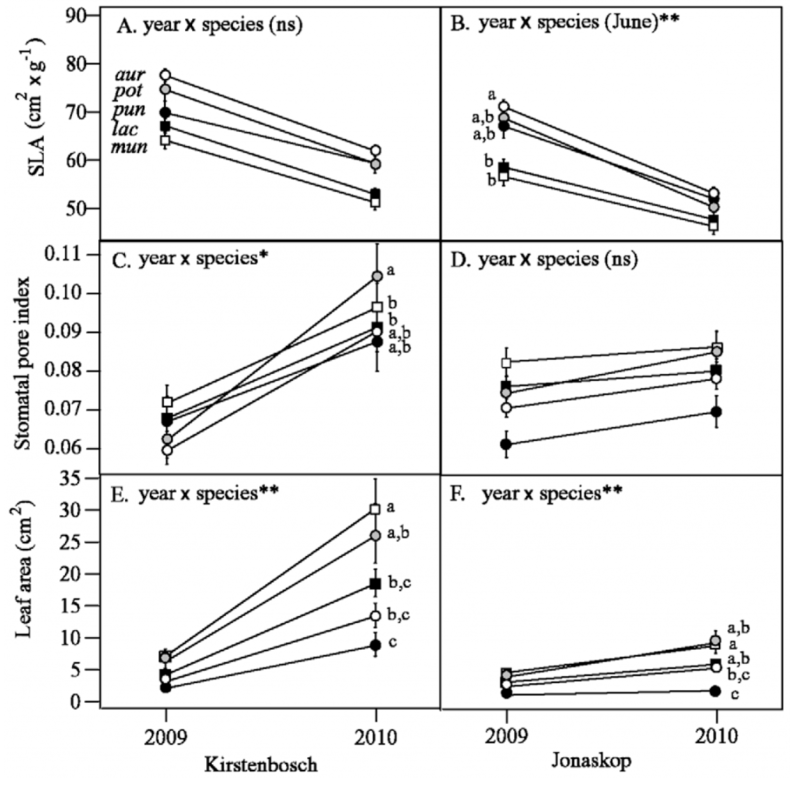 We also wanted to know whether the amount of change in leaf traits depended on measures of resource availability and rainfall seasonality in the places that seeds were collected from. Here we’re asking a more complicated question. I know that plants are often adapted to the local circumstances in which they are growing. If SLA reflects plant characteristics that are important in local adaptation to nutrients or water availability, then plants that grow in places that differ in nutrients or water availability should also differ in SLA in ways that make them well-suited to the place where they occur. 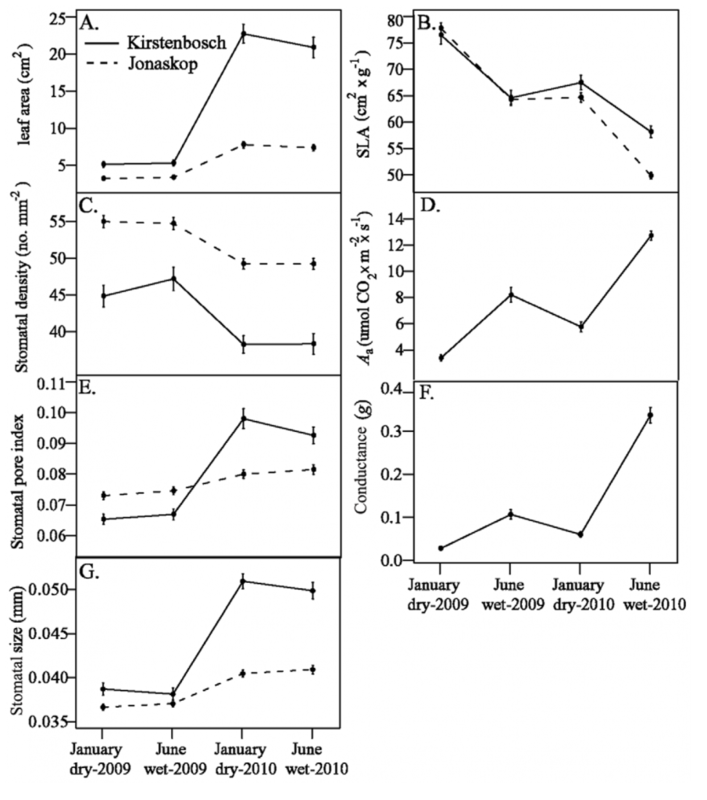 Do we have evidence that there is an association between changes in SLA and nutrient availability or precipitation patterns in the site from which they are derived? It’s that middle step that’s tricky. We don’t need to do anything special to run a regression on changes in SLA and home site characteristics, but to interpret that regression as evidence for the causal story in that middle step we need to do something more. Unlike the nicely randomized experiment with which we began this post, we aren’t randomizing plants across sites and allowing them to adapt. What we have is purely observational data to address this question. To what extent can we make a causal inference from these data? That’s the question I’ll turn to in the next installment.